It's the all "men's club" of famous tennis champs who gather each year in April at the clay courts of the swank Monte Carlo Country Club. This year, tickets go on sale in the autumn of 2018 and are available at Ticketmasters and other online ticket vendors. Meanwhile, stay tuned for the complete TV schedule of the 2019 Masters traditionally covered on the Tennis Channel in the U.S., TSN in Canada, Sky Sports in the UK and FOX Sports in Australia, with official live streaming of all matches on TennisTV.com. Due to the US time difference, weekday matches usually start in the wee hours of the morning at 5AM ET, with the weekend championship final on Sunday April 21, 2019 begnning at 8:30AM ET. One of the oldest and most traditional tennis championships, the Monte Carlo tournament was first held in 1897. It later became known as the Monte Carlo Open, before becoming part of the Masters Series in the early 1990's. Today, it is a top tournament with a Monte Carlo "glam" factor that few other venues can equal. The storied tennis courts of Monte Carlo include a roster of winners including Bjorn Borg (in 1977, 1979, and 1980), Ilie Năstase (1971-73), and Argentina's Guillermo Vilas (1976, 1982). In one famous battle, Novak Djokovic faced Spanish champ and 'King of Clay' Rafael Nadal to win the 2013 tournament, putting a stop to Nadal's record-breaking eight consecutive wins at Monte Carlo from 2005-2012. 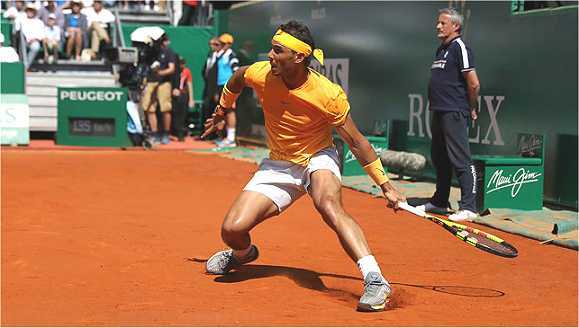 Rafael Nadal, on his way to his third straight victory at the Monte Carlo Masters in April 2018. In 2014, it was dark horse Stanislas "Stan" Wawrinka who won the title against the tennis legend, followed by another victory by Novak Djokovic in 2015. In recent years, however, Nadal is once again back on top with two back-to-back victories in 2016, 2017 and 2018. Can Nadal go four for four in 2019? Stay tuned. Monte Carlo Rolex Masters - The official site featuring the latest updates, feature stories, a 3D virtual tour, player profiles and interviews, photos and audio clips including daily summary & live scores, TV schedule. Yahoo! Sports - Tennis - Breaking headlines, photos, slideshows and news features from AP, Reuters and other top sources around the Web reporting in on the Monte Carlo Masters. Monte Carlo Masters - Wikipedia entry with a brief background history, and extensive lists of winners in the doubles and singles finals dating back to 1969, with related resources.